Tigo Rwanda launched a service that allows every Tigo customer to access Facebook for free. This follows a recent agreement signed between Tigo Rwanda and Facebook, which aims to increase digital access for the over three million Tigo customers in Rwanda. Only available to Tigo Rwanda customers, the product, called Facebook Flex, provides free access to Facebook either through the Facebook app on Android or via facebook.com on all data-capable devices on Tigo. Facebook Flex enables Tigo customers to control their data usage when using Facebook through a button that switches access between Free and Paid modes. Tigo’s Chief Commercial Officer, Yaw Ankoma Agyapong, unveiled Facebook Flex at a press conference at Tigo’s Headquarters earlier today. “At Tigo we believe in Internet For All. 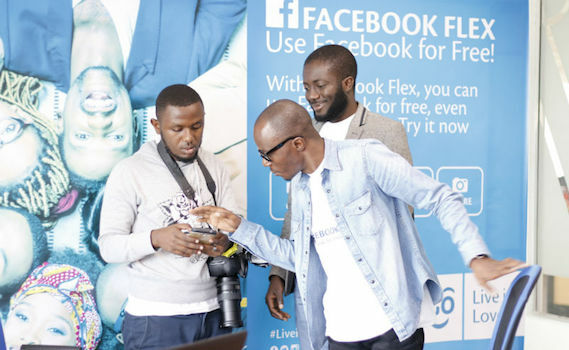 With Facebook Flex, even more Rwandans will be able to enjoy Facebook because you don’t need to have a smartphone or balance to enjoy the service,” Yaw Ankoma Agyapong said. He said as long as one is a Tigo data customer, “you will be able to like, comment and post as much as you want on your Facebook account”. “We are pushing an adoption of Internet and digital lifestyle in our country and doing this means getting as a big number of our customers as possible so that they can realize the benefits and comfort from having Internet access”. “Today we have only four million people connected to the internet. So there is still room to get more people involved,” he said. “The product that we are bringing to the market is very exciting because it will allow our customers to use Facebook for free”. How is Facebook Flex different from regular Facebook? This version of Facebook allows people to flexibly move between two modes – free mode and data mode. Free mode is a lightweight version of Facebook where you can post, comment, like, and chat for free. To view photos or videos, switch to data mode (full Facebook) by clicking the “View Photos” button. You will be charged for data (MBs) in this mode. Go back to free mode any time by clicking the “Go to Free” button. Will I have access to Facebook Flex even if I do not have an airtime/data balance? The free mode of the Facebook Flex service can be accessed without data charges, therefore, when you have run out of data or airtime, you are able to enjoy the free mode of Facebook. Who is eligible for Facebook Flex and how do I access it? All Tigo users can enjoy Facebook for free by default via Facebook Flex. To access Facebook Flex, customers can go to facebook.com using a mobile browser on a data-capable phone with a Tigo SIM card. All major mobile browsers, such as Google Chrome, Android browser, Opera Mini, and Safari are supported. Internet Explorer mobile browser and Firefox browser for Android may be supported but are not guaranteed to be supported. WAP browsers are not supported. Alternatively, customers can access Facebook Flex through the Facebook Android app. The core Facebook Flex feature is supported in the Facebook Android app version 43+ (released Oct 2015). Some user interface improvements were made in version 61+ (released Feb 2016). But the core toggling functionality between free mode and paid mode is available in version 43+. Facebook iOS app, Facebook Windows Phone app, and Facebook BlackBerry app are not supported. Customers using these operating systems would need to use a supported mobile browser to access Facebook Flex. When I use Facebook Flex, I can see photos. Am I being charged? If you are in free mode, you are not being charged. You can check if you are in free mode by looking at the top of your Facebook. For new Facebook users or Facebook users that haven’t used Facebook in a while (last 30 days), you may still be able to see photos in free mode. This is a temporary promotion for your first 30 days on Facebook. Once these 30 days are complete, you will no longer be able to see photos in free mode. How can I view the full Facebook experience? You can view the full Facebook experience with photos and videos by clicking on “See Photos” button, which switches you to data mode. Keep in mind that standard data charges will apply. You can go back to free mode anytime by clicking the “Go to Free” button. How do I opt out of using Facebook Flex? What if I initially clicked “No Thanks” to Facebook Flex but now I want to use it? What if I started using Facebook Flex but now I don’t want to use it anymore? To opt-out of Facebook Flex: When in data mode, click on the “?” next to “You’re in Data Mode.” (See “Facebook Flex Opt-In/Opt-Out” screens in row one.) You can also visit your Facebook bookmarks (if using the Facebook Android app) or Facebook menu (if using facebook.com) to opt-out. Is Facebook Messenger free in Facebook Flex? Parts of Facebook Messenger are free. The customer is able to send/receive text and upload/view photos. Uploading and watching videos through Messenger is not free and the customer will be charged. Also, voice calls through Facebook Messenger are not free. If I click a link in Facebook Flex, is it free? No. In Facebook Flex, you can chat, like, comment, post, share, and upload photos for free. If you want to view photos, watch videos, read articles, or make voice calls in Messenger, you will be charged your standard data rate by Tigo. If you try and click on a photo/video/link, you will be warned with a popup telling you that you are leaving free mode and will be charged at your standard rate. I registered for Facebook Flex with my Tigo number, can I still access Facebook flex from a different operator? If you access Facebook with a non-Tigo number, you will not receive Facebook Flex. Facebook Flex is exclusive to all Tigo users. I registered for Facebook with my Tigo number, now I cannot access Facebook Flex, Why? Facebook Flex is available to all Tigo users. Please restart the Facebook Android App or refresh your Facebook on mobile browser, Facebook Flex should appear. If you are not able to see Facebook Flex, please call our customer care at 456 or 100.